Blogger Style - The Book! Ever since I started blogging, and reading blogs before that, I've been blown away by the amazing talent that there is in the blogosphere. These are everyday people - homeowners, renters, crafters, DIYers - who put together beautiful homes using their own skills and creativity. We who read these blogs are exposed to a sea of original and inspiring ideas and achievable design on a daily basis. Wouldn't it be great if more people could see what design blogs have to offer?? I am very excited to tell you that is going happen. Announcing... BLOGGER STYLE. The book. Together with my husband Sean (aka HandyMan), I am pleased to be writing BLOGGER STYLE for John Wiley & Sons, publishers of books by Candice Olson, Sabrina Soto, numerous titles for Better Homes & Gardens and many more. This will be the fourth book that Sean and I have written (here are the others) and we can't wait to tackle this subject which is very close to our hearts. Its about time the design spotlight was put on bloggers! Bloggers are gaining in influence, appearing on design shows and in the pages of your favourite magazines. This will be the first design book to recognize that shift and put bloggers at the forefront, celebrating their talents as a legitimate and important source for design inspiration and knowledge. 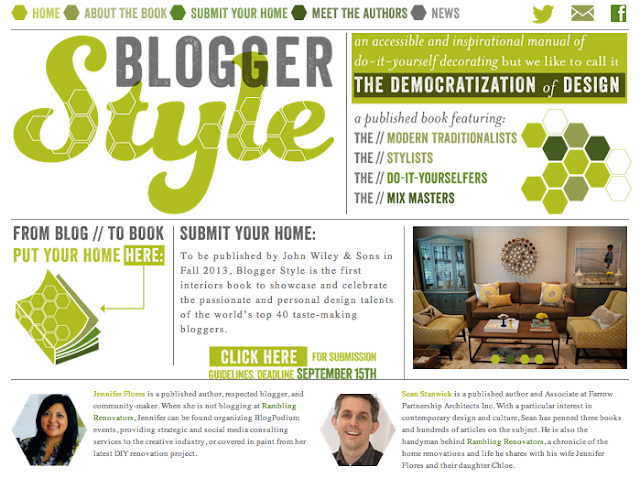 BLOGGER STYLE will highlight both the bloggers themselves and their innovative interiors. It will feature real style by real people - you don't need a design degree to create a beautiful and inspiring home! We like to call it The Democratization of Design and we're thrilled to document it with our book. Are you a blogger with an incredible home that absolutely should be featured in BLOGGER STYLE? Now's the time to toot your own horn! Submit your home today for consideration! Do you know of a blogger, a hidden gem, with a fantastic sense of style? Tell them about BLOGGER STYLE and get them on our radar. Can you help spread the word and post about the book on your blog? We'd love it if you could! Feel free to save the image below and direct your readers to the book website at www.blogger-style.com. There are only 40 blogger profiles in the book and we want to showcase the best of the best. The blogosphere is a huge place and we want to know who catches your eye, who has the best Before & Afters and most inspiring ideas? Shoot us an email here if there is a blog you think we must see. There is a lot of writing to be done and not too much time to do it. The book will be published in Fall 2013. If you'd like to be considered for the book, the submission deadline is September 15th. Write us today! I've been dreaming about writing this book for a long time. I can't wait to show the world what we bloggers do!! To keep up to date on BLOGGER STYLE, you can check out our website, follow us on Twitter and on Facebook. A very special thank you to Kathleen Shannon for developing the BLOGGER STYLE branding (you'll see more of her work in the book!). Awesome. I remember talking to Sean during our dinner in TO about yours and his ideas for your book! Congrats that is has come to fruition! Not sure if my home is book-worthy - but I will toss my hat into the ring! So exciting! I cant wait to see all the fun ideas that are going to be FILLED in this book! That is such exciting news. If any two people could do this book justice, it is you two. I'm looking forward to seeing it. Such exciting news!!! Look forward to buying a copy! This is fantastic! Can't wait to see it in print. Jen! I'm so excited for you! What a fabulous book idea. Can't wait to see who you feature. Congratulations Jen. This is such an exciting adventure. THe branding looks incredible. I can't wait to hear about the next steps. What a great idea! Congrats and can't wait to own a copy! Aaaaah! I can't believe I just discovered your blog!!!!! Wonderful and amazing, you and your hubby are so creative! I've seen a lot of your rooms at HOUZZ, but I never thought of delving into WHO did the rooms over at the site ( I guess because I assume everyone who posts there are professionals, except for me LOL!) anyhow, congratulations on this upcoming book!!!!!! I'm a relatively new blogger myself, started blogging last sept. ( yey, gonna ba 1 year old soon), not sure if my house or some of my ideas would be book worthy, but if you have time, please check it out. :-) thanks and keep up the great work! Congrats Jen!! Can't wait to see! Yay yay yay! This is very exciting news Jen, and I cannot wait to have that book on my coffee table :) Best of luck with the entire process, I know this will be a huge success. You are one smart woman! and of course you got a very good partner in crime, Sean! This is a brilliant idea. I can't wait to hear about your next adventure...BTW, when I left my previous job ( a planning and urban design firm) one of the gifts I received was the book you and Sean wrote! Jen-Congratulations to you and HandyMan! I think I might have to enter, of course that means actually shooting some better photos (which I've been meaning to do anyway). How great for you two! Looking forward to the book. We just bought a house and will be redoing every room - maybe eventually we'll have something book-worthy. In the meantime blogs have been huge inspirations (in terms of design and keeping us motivated). The book will just add to it. I love this idea! Congrats! Will all houses featured be new ones not seen in other publications? Thanks! There will be a mix, some houses you've seen before that have great design lessons and are worth repeating; and others that are hidden gems and deserve the attention. I'd love to hear your suggestions on who you think should be included! Let me know at info@blogger-style.com. Fun. I may have to put a submission together. I love that you are focusing on the talents of bloggers for a book! I can't wait to buy a copy! wow!! now that's an exciting news! Can't wait to see the book in Fall 2013! Wow! This is amazing Jennifer. I am thrilled for you and your hubby. What a fantastic premise for a book. Congrats! Oh my gosh, this is super exciting news!! I WISH I had a home book-worthy because I'd love to be a part of this. I cannot wait to see who you profile. This is going to be a must-read for so many people. Amazing idea - you're so innovative!! Congrats Jen! Can't wait to see it when it comes out! how exciting!! good luck on this venture.. I can't wait to see this!! I added the submission info to my blog tonight. Just wanted to help spread the word about your great project.